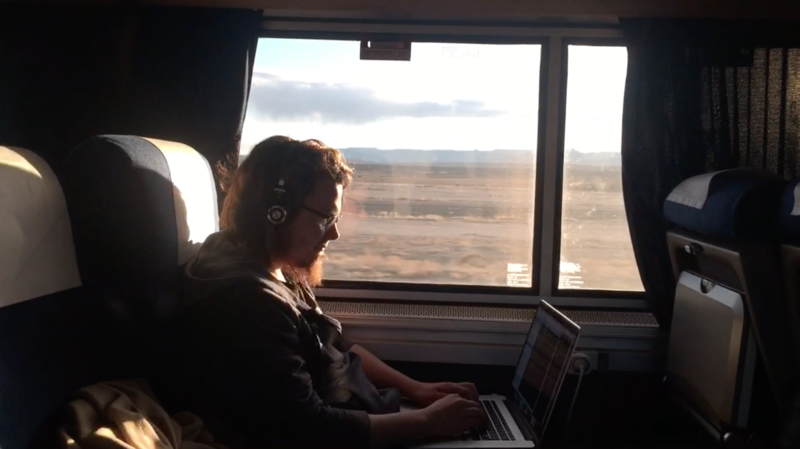 As a part of our scholarship program, Finnish Game Jam sent Miikka Harjuntausta to the Train Jam (US) to represent the Finnish jamming scene. 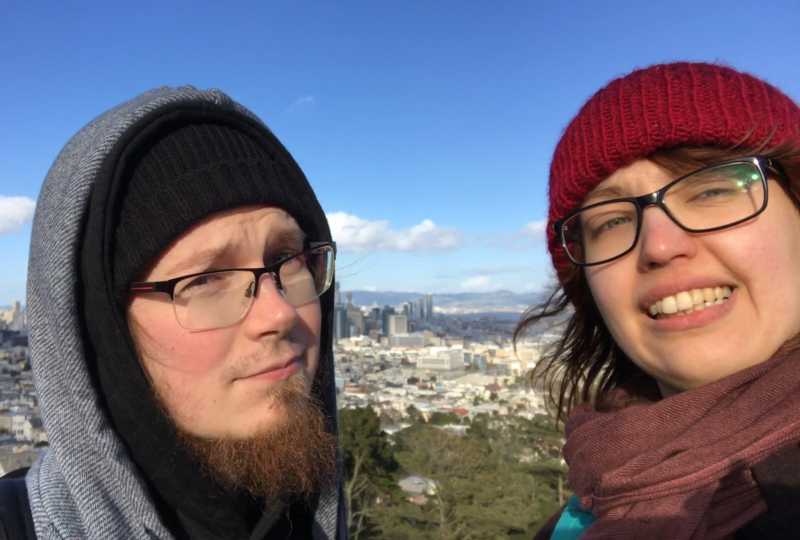 Miikka traveled to Chicago from where over 300 jammers boarded a train to create games during the trip all the way to San Francisco. Miikka shares his experiences and tips in this report. This is my report from Train Jam 2017. I will be writing this for you that might be participating Train Jam in the future. I made my trip with with an awesome artist called Krista Erkkilä. Train Jam is a game jam event that takes place in a train ride from Chicago to Emeryville, eventually ending up in San Francisco. This was the 4th time it was organized, and the first year when Amtrak was involved and the whole train was reserved just for us developers. There were over 300 game developers taking part in the train jam this year, with very different background varying from students to industry veterans. Most important thing for the jam is to make sure your laptop is battle ready. There is no internet on the train, so you need to have all the necessary programs and resources downloaded beforehand. Remember also to have your favourite playlist of music and entertainment ready as well. A USB-stick might be the most reliable device to transfer data in train. Be sure to join social channels on slack/facebook/twitter to chat and meet with people before departing! It is over 10 hour flight from Helsinki to Chicago, and combined with the adjustment to time difference, it is a good idea to fly in a day or two early. That’s what we did, and we were not disappointed. Chicago is a great city to explore. Random recommendation, watch movie Source Code at airplane or before the trip. It has Chicago and the train, and it is also a decent movie. Boarding day was a bit loud and chaotic. At first all 300+ train jammers gathered at the train station. Then we went through the whole travel plan once more. Theme announcement, brainstorming and teaming up was also done before the boarding. Train seats are filled in the order you are entering the train. Each carriage has two floors, but the best view you get from observation car where you can go whenever you want. You can bring your own snacks (except nuts were prohibited). And you can purchase chips, candy, gas station-grade warm foods and cold drinks from the train. Each day the restaurant cart also served meals for those who wanted. Even though food was not that great, it was a nice opportunity to take a break and sit down to chat with some other jammers for a while. After the Train Jam. GDC. San Francisco. After you have traveled from Chicago to San Francisco it would be stupid to leave right away. San Francisco is great city to chill, and the Game Developers Conference begins two days right after the Train Jam. In GDC there is also a gaming booth (hosted by Itch.io) for all the train jam games. And even if you don’t have money for full-access pass, GDC is great time to meet and greet more fellow developers. I also collected some video material which I combined to few fast cut videos. Finally, thank you again FGJ for this great opportunity. I hope this report is useful for someone somewhere. Feel free to contact me if you want to chat more about anything. Love each other. Goodbye.